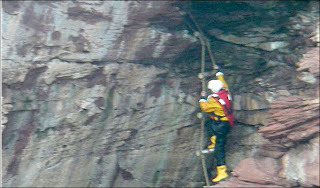 Lifeboat crews today revealed they found a house built into a cliff face while searching a stretch of coastline. The surprise find was made by Arbroath RNLI lifeboat crew while responding to reports of cries for help coming from the caves. They discovered the house, within a cave, complete with wooden floor, seats, painted walls and tea tree lights. No one was found within the house, and the coastguard is currently investigating further. The lifeboat team was sent out at the request of the coastguard following the emergency call on Tuesday afternoon. 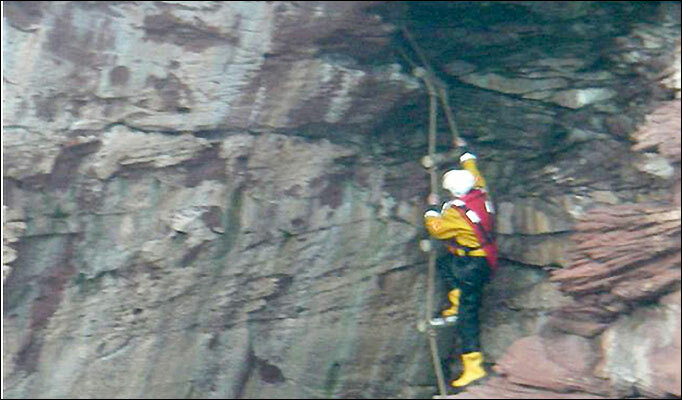 During their coastline search to the north east of Arbroath, in Angus, Scotland, they came across a rope ladder bolted to a cliff face. A crew member discovered the ladder led to a wooden wall and a locked door – complete with porthole window – sealing off a cave. Allan Russell, mechanic for the Arbroath RNLI lifeboat, said: "This is certainly the most unusual thing I have come across during my ten years as a lifeboat man. "There was a well-laid wooden floor, tea tree lights and parts of the walls have been painted. He added that he could not divulge the exact location of the cliff house "to prevent the curious from seeking it out and potentially putting themselves at risk".